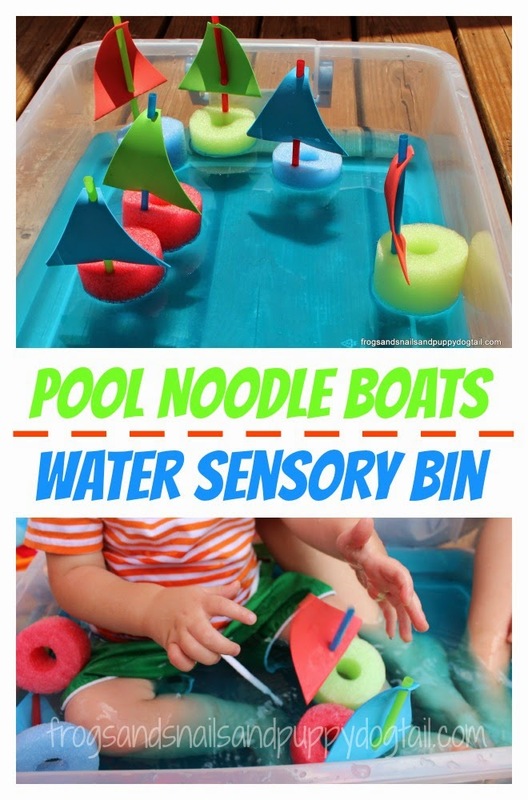 Last year I cut up some pool noodles for a pool noodle water bin. We have since had a lot of fun with these pool noodles. 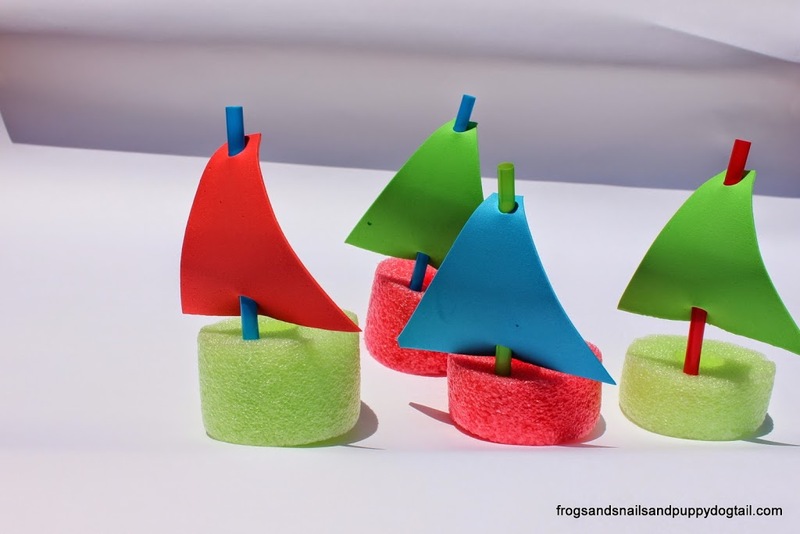 One of the things we tried last year was pool noodle boats. They kids had a lot of fun with them in the bath tub. A year later and we still have our cut up pool noodles for playtime. 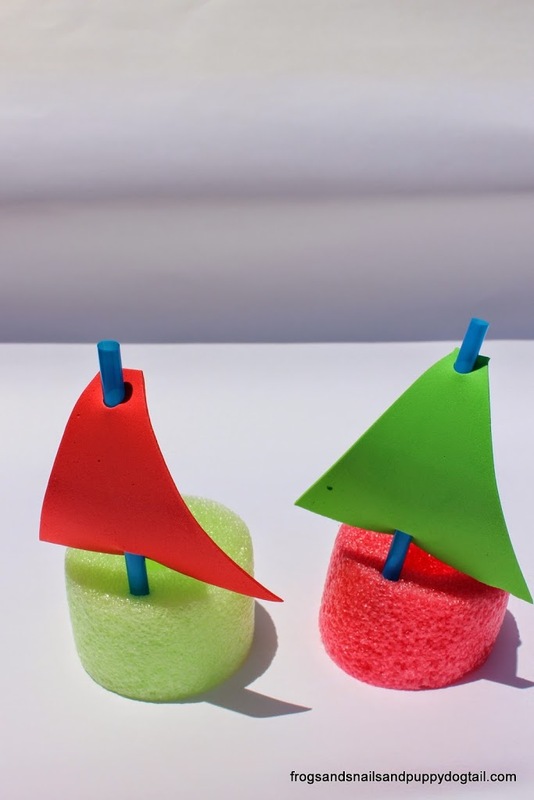 I decided to make some new and improved Pool Noodle Boats for the kids this year since I had plans to use them in a sensory bin. Above is a picture of the boats I made last year. I cut out “sails” from the foam sheets. 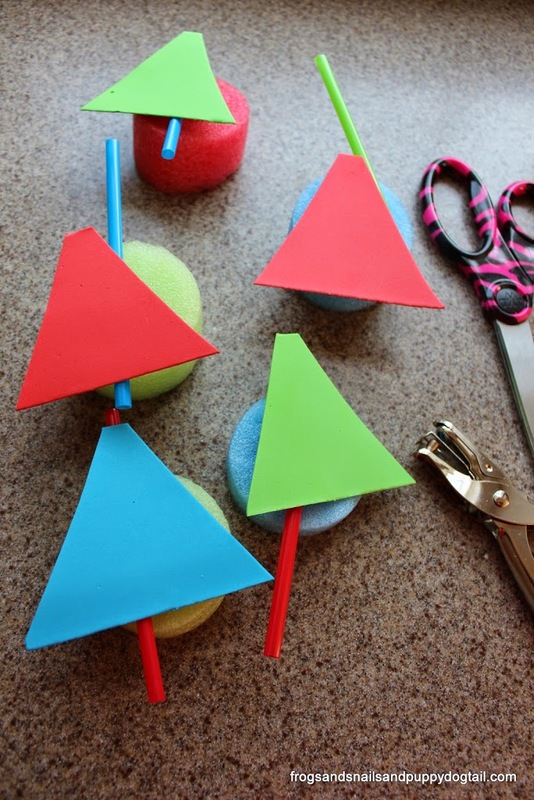 I used blue, green, and red colored foam sheets and cut out triangle shapes. I then cut the straws down so they were not so long. I then took the hole punch and punched 2 holes in each sail. One on top and bottom. I used these hole to slide the straw through. I then poked the sharp tip of the scissors into the pool noodle and put the straw in the small hole. 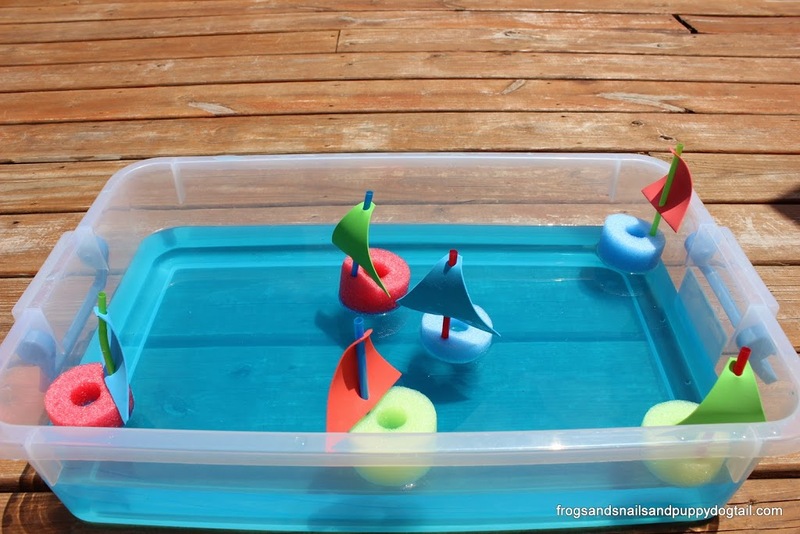 Now we had Pool Noodle Boats. I just loved the bright colors of the boats. Now the question was would they float with the new design? 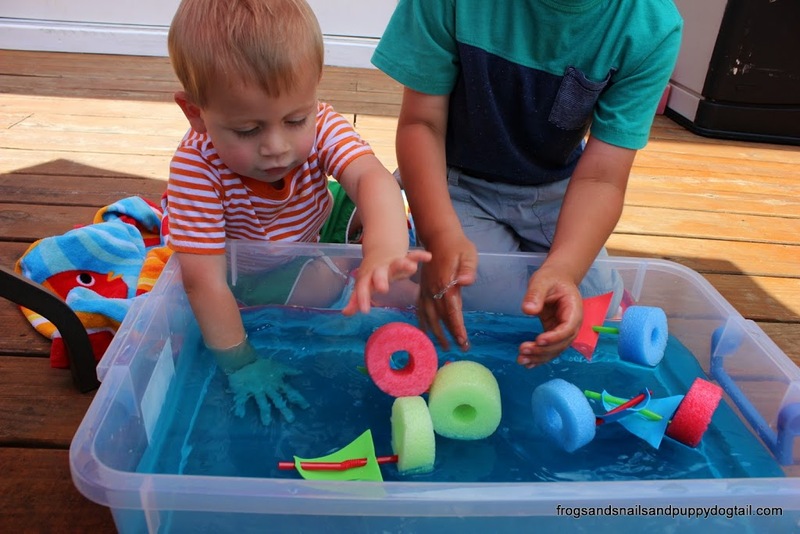 I made the kids a Pool Noodle Water Sensory Bin for playtime. 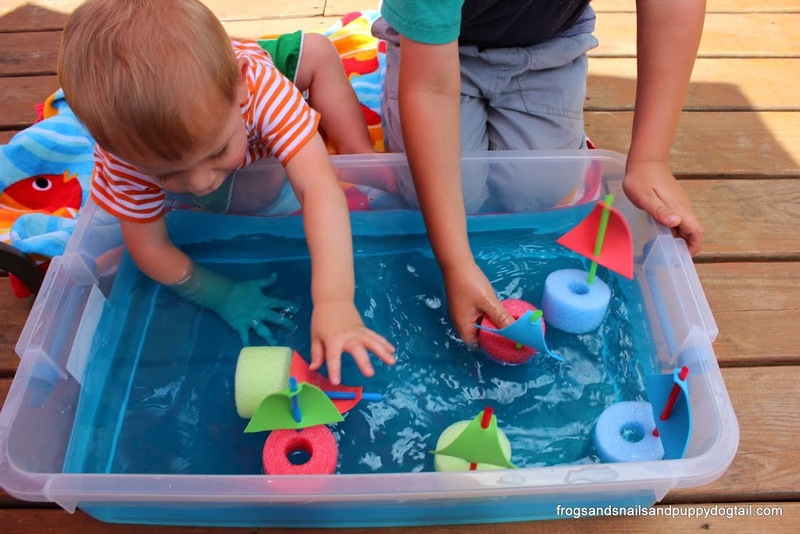 We LOVE water play at my house. 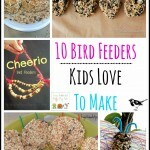 It has been a great way for my multiple aged kids to play together time after time. 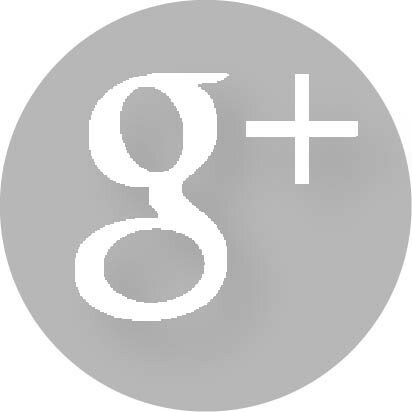 My kids are 5yr – 1yr. Last year it was big brother and little brother playing and this year baby brother is getting in on the fun too. This day little brother was running around in the yard and did not want to come play in the water bin. Big brother and little brother could not wait to get their hands in it. As you can see they did float. My oldest kept knocking them on their sides and flipping them back over. 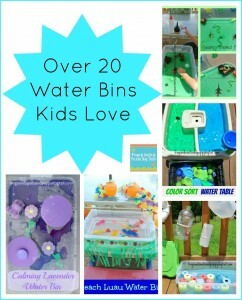 I have used small amounts of blue food coloring in the past for our water bins and the bath color tabs. They work well without staining. This day I added a water flavor packet and baby brother ended up a little blue! After a good bath only his toes remained with a blue tint. The blue water did smell wonderful during playtime, haha. But we will not use water flavor packets again anytime soon. Baby brother was the only one that climbed in and sat in the bin. That is why he was the only one who was blue from the waist down. Just playing the day away! 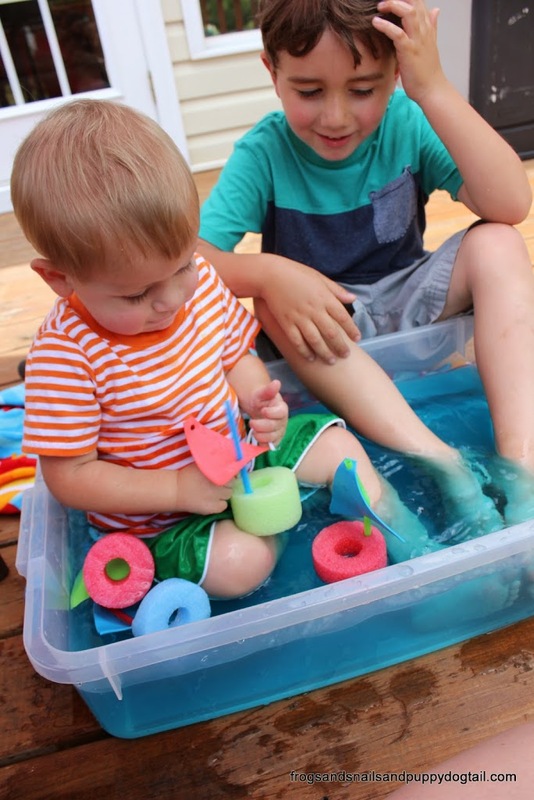 Sensory water bins are great for the exploration of our senses. Sight- the color of the water and boats. Touch- the feel of the boats and water. Smell- the fruit scented water. 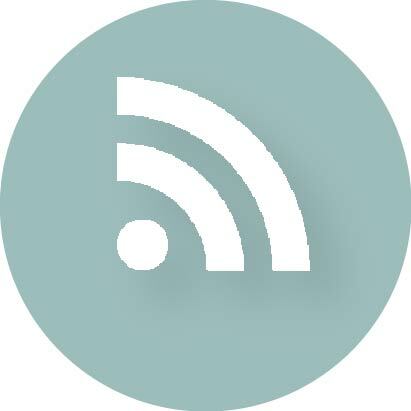 Sound- the sound of water splashing. 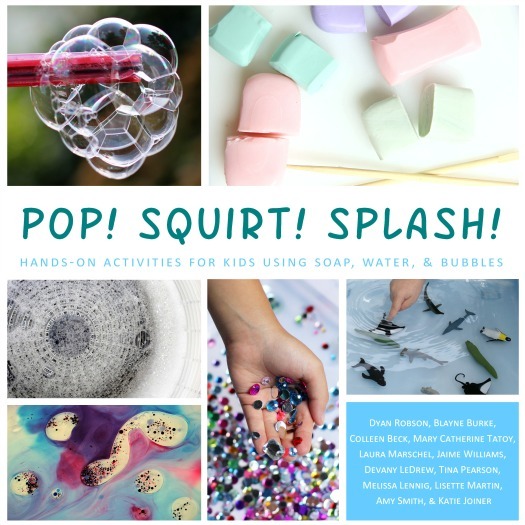 This play activity is also a great way for siblings to learn to share and play together. This bin was fun way to go over colors and count, as well as to just have fun! 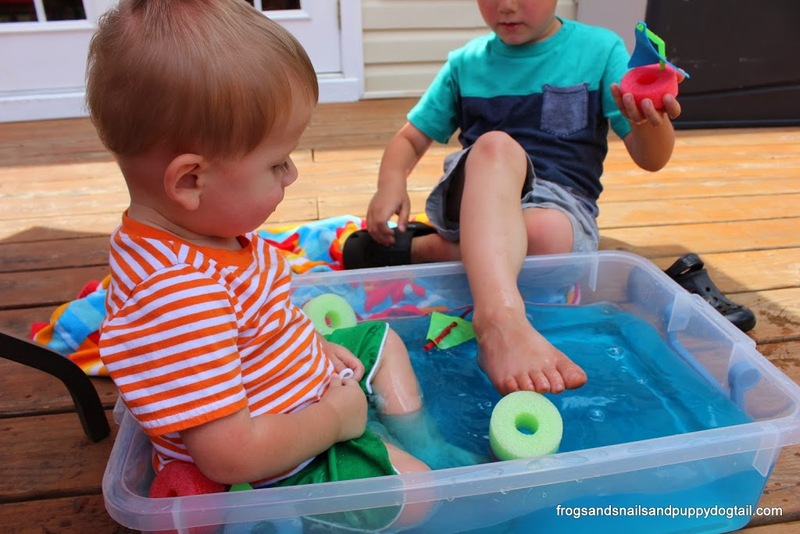 Water play is a great way to have fun and stay cool in the hot months. 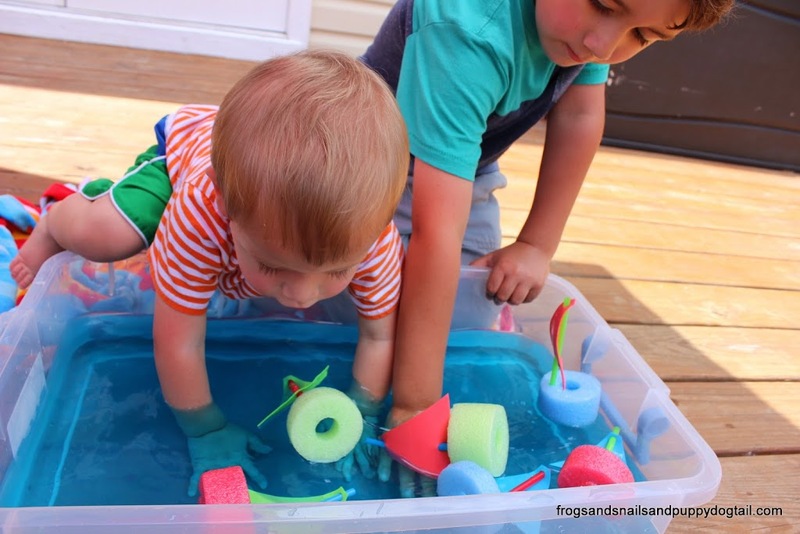 What are some of your favorite water play activities? 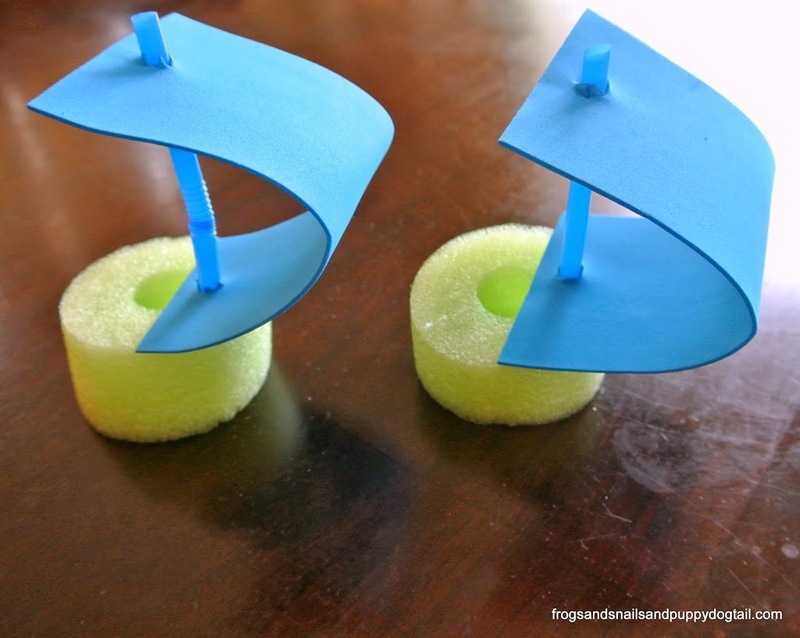 I love your pool noodle boats! 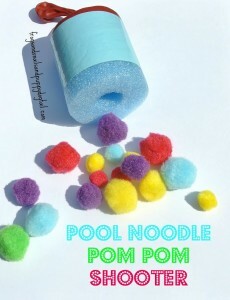 I saw your post before and then saw it again on The Educators’ Spin On It which reminded me that I need to go and get a pool noodle to try it out with our kids. 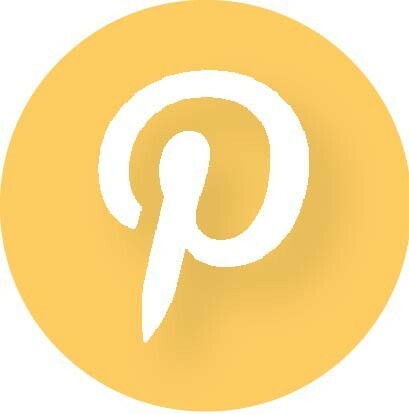 Please share on Artsy Play Wednesday (open through Sunday). 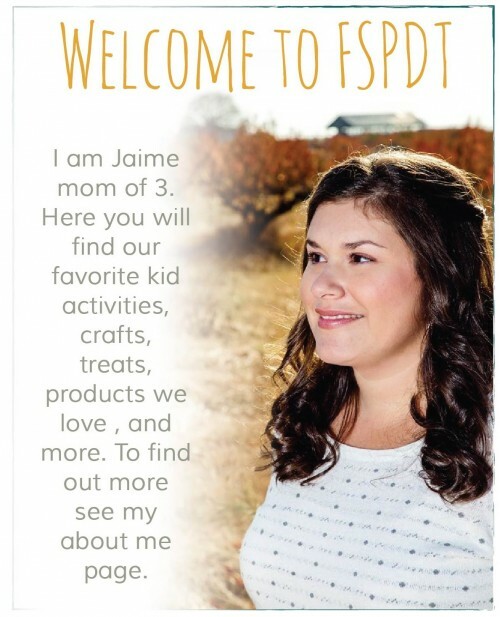 Jaime great idea; but where did you purchase the round Styrofoam from? What craft store? 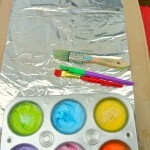 I want to do this project with my preschoolers family Fun Day. I need to know where to go purchase or price these items as soon as possible this weekend. I am on the committee. This is posted 5-08-2015 HELP!!!!!!! Hi! 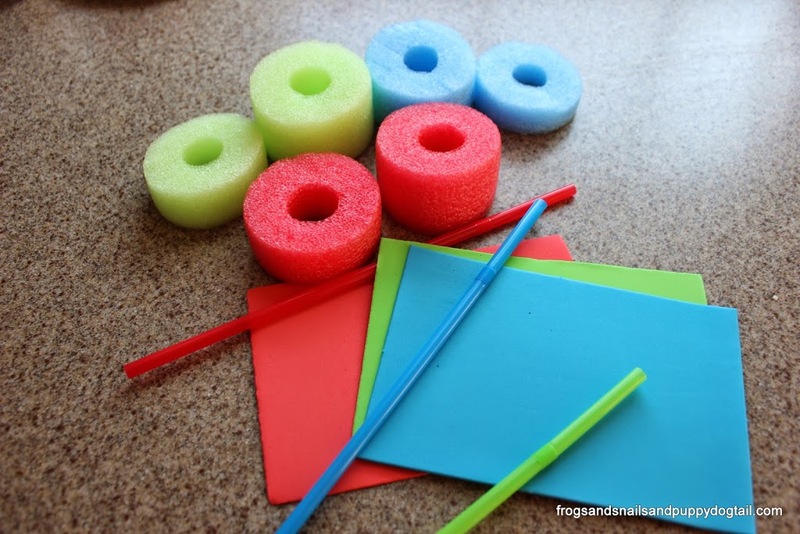 They are cut up pool noodle. Hope that helps.